As the second largest supplier of intravenous (IV) solutions to the US market and the only IV solutions producer not to experience significant production challenges over the past year, we at ICU Medical, Inc., believe we can make a valuable contribution to the discussion of drug shortages. We recognize that the stakes for our patients and country are high and are fortunate to have participated in the American Society of Health-System Pharmacists (ASHP)/American Society of Anesthesiologists (ASA) Summit on Drug Shortages, September 20, 2018, in Washington, DC.1 As reflected by the attendees at the summit, a concerted effort with collaboration across multiple stakeholder groups is required to resolve these complex issues. The stakeholders are diverse and include patients, clinicians, professional societies, manufacturers, hospital systems, group purchasing organizations, and regulatory bodies—just to name a few. In this article, we will review the present understanding of the history of IV solutions as a pharmaceutical category, discuss the IV solutions marketplace today, and the steps we believe are required to move to a state of reliable, high-quality supply. 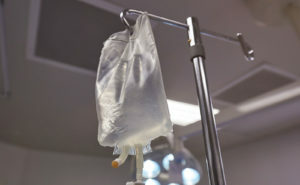 The recent shortages of small volume parenteral (SVP) IV fluids were driven by the manufacturing disruption from Hurricane Maria superimposed on reduced supply due to manufacturer quality issues.3 The reduced supply of SVP products, including normal saline, led to widespread disruption in the delivery of health care in the US and globally as these products are used for hydration and preparation of numerous additional widely used medications. Without adequate substitute products, clinicians faced difficult choices, including rationing IV fluids and utilizing workarounds. With a focus on SVPs, an understanding of the history of these products is essential to interpret recent events and the challenges going forward. Today’s IV solutions manufacturing industry is the result of decades of decisions and “looking the other way” by manufacturers and purchasers. In the case of IV fluids, purchasers range from the individual medical clinic to large health systems and Group Purchasing Organizations (GPOs). Historically, IV fluids were treated as “medical-surgical” items rather than capital-intensive pharmaceutical products. Instead of searching for market equilibrium ensuring the stability of business, manufacturers have operated without price transparency or logic as IV solutions were co-mingled with other supplies such as infusion pumps and IV tubing and provided at a discount. In parallel, purchasers of these products demanded and utilized concessions when comparing product offerings and making buying decisions. While the contract bundles promised savings for the purchaser, IV fluids were bought and sold at artificially low prices and slim margins. These forces have led to a liter of saline costing less than a liter of many brands of bottled water. Intense cost pressure has impacted the geographic location of manufacturing plants, where tax incentives, labor market conditions, and transportation expense have contributed to favorable economics, such as in Puerto Rico. Over time, the production has become concentrated and constrained, with nearly all IV solutions in the US market being manufactured by three companies: ICU Medical, Baxter and B. Braun—with Baxter concentrating its SVP manufacturing in Puerto Rico.3 Growth of supply has been limited as the financial conditions of the market discourage new entrants and reduce the incentive to expand manufacturing beyond obligated volumes. Regulatory and quality requirements contribute additional cost and complexity to the industry. IV fluids are regulated as pharmaceutical products and carry all of the capital investment requirements of sterile injectable medications despite being sold at relatively low prices. Over the last twenty years, the cost of the pharmaceutical ingredients and the plastics to produce a unit of saline has slowly increased while the cost of appropriate regulatory and quality maintenance has increased several-fold. For example, changes in raw material suppliers and improvements to manufacturing equipment can require significant qualification studies and data collection in advance of regulatory submission to ensure the changes do not impact the safety, efficacy, purity, or quality of these pharmaceutical products. Additionally, changes impacting globally registered products may involve generation of multiple data sets and regulatory filings due to lack of regulatory harmonization. The steady rise in regulatory requirements, plus the high stakes of maintaining compliance in a changing environment add an additional barrier to growing the supply. Despite these challenges, the reliable, high-quality supply of IV solutions is realistic and coping with shortages can be improved.4 Manufacturers can offer more price transparency to illustrate the stand-alone value of the category and sign reciprocal agreements to back up the supply chain. Customers can use their market power to source IV solutions from two or more suppliers, offer long-term commitments for predictable contracts and value the category as a pharmaceutical product. Manufacturers can develop contingency plans including developing excess capacity and redundant manufacturing locations. Additional product stock can be distributed and held throughout the health care supply chain to sustain clinical operations during shortages. Techniques for conserving fluids, such as conversion from IV to oral therapy and vigilant discontinuation of nonessential infusions, should be implemented into clinical practice. Evidence-based medication handling should be followed including considerations for improved utilization of single-use vials, extending product use dates, and empowering pharmacists to bring techniques forward to maximize supply management. Developing the manufacturing capacity to reliably meet the needs of our health care system is possible; however, it is virtually impossible for manufacturers to turn this capacity on and off quickly due to significant labor, capital, and regulatory requirements. We are looking to bring pragmatism and transparency to the economics of the industry that will help ensure that this capacity is utilized more consistently and intelligently by the market overall, helping to minimize the impact of future production shortfalls in the market. Long-term continuity of supply will come from demand stability and valuing these products as a capital-intensive pharmaceutical category. Until that day arrives, contingency planning for management of shortages will continue including transparency, communication, and collaboration across diverse stakeholder groups to serve the needs of our patients and clinicians. Dr. Beard is currently the medical director of ICU Medical, Inc.
ASHP, 9/19/18 Press Release. Summit on drug shortages to examine impact on national security and health care infrastructure. https://www.ashp.org/news/2018/09/19/summit-on-drug-shortages-to-examine-impact-on-national-security-and-health-care-infrastructure. Accessed December 17, 2018. Drug shortages roundtable: minimizing the impact on patient care. Am J Health Syst Pharm. 2018;75:816–820. Mazer-Amirshahi M, Fox ER. Saline shortages—many causes, no simple solution. N Engl J Med. 2018;378:1472–1474. Fox ER, McLaughlin MM. ASHP guidelines on managing drug product shortages. Am J Health Syst Pharm. 2018;75:1742–1750.